In the first two years 90/91 the Top 10 of the German charts featured a lot of brilliant songs from various genres and sources. But when on January 6th 1992 Nirvana's 'Smells Like Teen Spirit' entered the charts it was not the start of a new era for successful indie music like it was in the UK. Over there the artists of the Britpop wave were responsible for about 60 Top 10 hits between 93 and 97 where in Germany their greatest success was a #17 placing for Oasis' 'Wonderwall'. So in Germany the years 92 to 94 witnessed a steady decrease of great Top 10 hits and consequently, in the second half of the decade, there was not much left to be enthusiastic about. As with Blue Monday in the 80s we have a clear winner here. Although Sinead O'Connor's mighty ballad was a serious contender. And in third place we find a perfect pure pop song performed by a former Levi's jeans model. Also a very 80s concept. 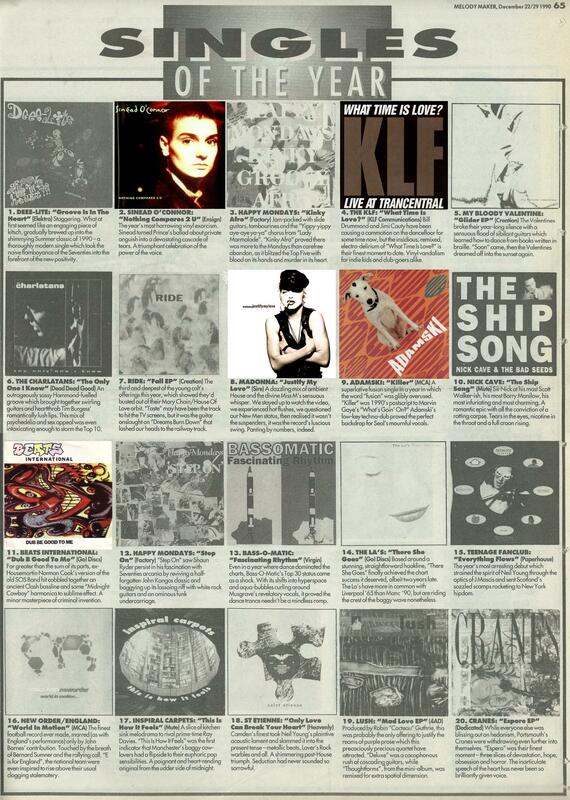 At the start of the 90s the German charts and the British music press reached their uttermost congruence. 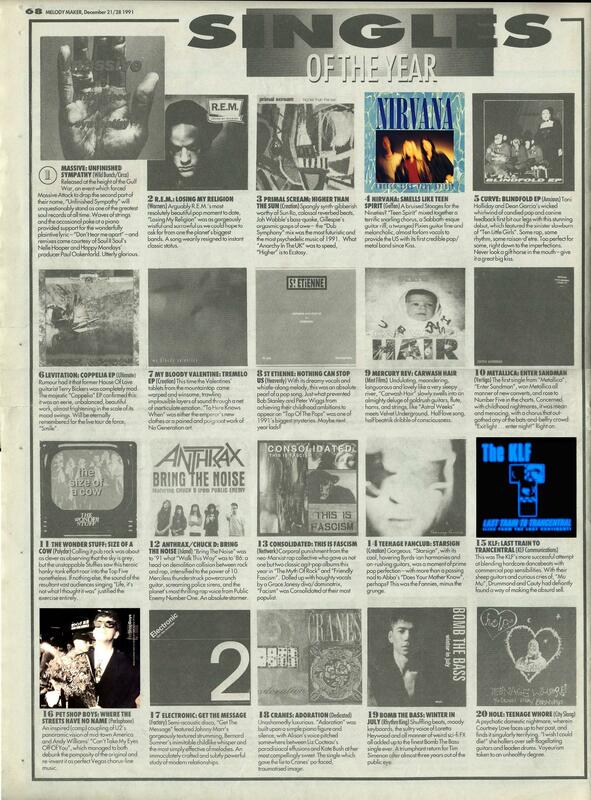 The Top 20 singles lists of the years 1990 and 1991 as published by music magazine Melody Maker featured 9 singles which also reached the German Top 10. 8 of those are presented on this page. The ninth, Metallica's 'Enter Sandman' has been omitted, because, well, let's say it doesn't suit the occasion. The years 90/91 only witnessed the start of the Euro Dance movement which then would dominate the charts in the following years. But Snap's The Power layed out the template for it, so blame them if you want. At the start of the 90s it was very hip to have some dance beats in your songs even for artists that were usually more the acoustic type. Of course this was done purely for artistic reasons. Not a genre but just one band, albeit a very prolific one. They managed to have 5 Top 10 hits in that period with two of them being a cut above the rest. The band history of the KLF is a tale rich in tragedy and comedy. It was just a question of time when House & Techno would reach the mainstream and therefore the higher reaches of the German charts. Purists will lament this trend of course. After dominating 80s pop both Depeche Mode and the Pet Shop Boys continued their supremacy of the charts at the start of the new decade. Sadly the Pet Shop Boys stopped having Top 10 hits after 93's 'Go West' whereas Depeche Mode, due to a very loyal fanbase, managed to have high chart entries up to this day. Amidst all the electronic stuff there were also a few successful guitar based songs to be found. The British Baggy hype only briefly touched the German charts in form of songs by The Farm and EMF. And after struggling for a decade even U2 managed to come up with a decent song. Because the Sister Of Mercy failed to have big hits in the 80s they changed their tactic in the 90s and used successful female singers as co-vocalists. In the case of this song which featured Israeli singer Ofra Haza (#1 in 1988 with 'Im Nin'alu') it payed off well. But when they tried to repeat this formula with singer Terri Nunn (#2 with her band Berlin and song 'Take My Breath Away' in 1986) on the song 'Under The Gun" a year later they only reached #40. Frustrated they stopped releasing singles for good and limited themselves to touring. This song builds a bridge to my 80s list as this song samples Alphaville's 'Sounds Like A Melody'. But contrary to the dozen other songs derived from 80s hits this adds enough own elements create a real new piece of music. One of three top 10 hits for The Prodigy, the other being 'Firestarter' and 'Breathe' in 1996 . Their success had a lot to do with their strong visual identity via their videos in a time when music television was still a major force in promoting bands. Two decades after there last chart entry 70s cult stars Sparks surprisingly hat another hit, the biggest one of their career. Fast forward another 20 years and they are still en vogue with their collaboration with "youngsters" Franz Ferdinand. TLC's metaphor-heavy 'Waterfalls', Faithless' 'Insomnia' (which was for electro riffs what Black Sabbath's 'Paranoid' had been to guitar riffs), the two further hits by The Prodigy mentioned above and finally, anticipating the state of the charts in the new century, Moby's 'Why Does My Heart Feel So Bad? '.